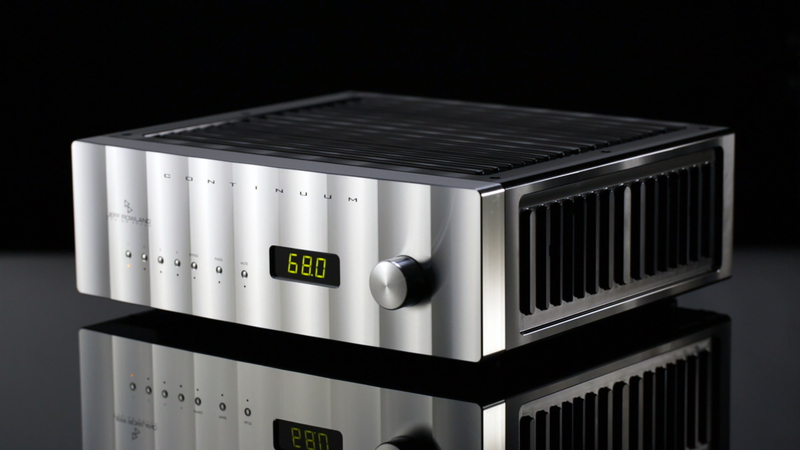 Featuring enhanced sonic performance and flexibility, the new Rowland Continuum Series 2 integrated amplifier delivers stunning dynamic realism and expressive refinement through advanced topologies. Continuum S2 integrates the new Capri S2 preamplification circuit, input/output, and control features with an innovative 400 watt power amplification stage into a single chassis. The amplifier delivers the trademark Rowland musicality, resolution, and unfailing authority to the most refined audio environments: challenge Continuum S2 to the extreme dynamics of high-resolution digital sources and the power requirements of large bi-wired speakers. Apply it to the complex loads of electrostatic panels in analog rigs. Admire its exceptional realism driving single-wired studio monitors in a sophisticated multi-media system. The elegance of Continuum S2’s ergonomic console emerges from a solid block of aircraft-grade aluminum. Discover the impressive complement of standard input/output interfaces. Enhance its flexibility through the optional DAC card, or its fully redesigned phono stage. Integrated 400W balanced amplifier design housed inside an elegant, ultra-low resonance, structurally rigid chassis that is precision-machined from solid blocks of aircraft grade 6061-T6 aluminum that is completely sealed for trouble-free operation and high RF and EMI isolation. Regulated, high speed, vanishingly quiet switch mode power supplies (SMPS) ensure consistent performance under all operating conditions. Advanced linestage circuit based on the sophisticated topology of the Capri 2 preamplifier yielding and incredibly refined musical experience from a compact and efficient system. All resistors are low noise, 0.1% thin-film type for extremely low thermal noise which complement the low-noise characteristics of the active circuitry. All circuitry is populated on one side of a 4 layer circuit board to allow for continuous, unbroken, low impedance ground and power supply distribution planes. Care was taken to minimize signal path lengths and components sizes. Twin ultra- high efficiency power conversion modules yield 400 Watts per channel into 8 Ohms, doubling over 4 Ohms, and a peak current of 40 Amps. Continuum S2 balanced output stages are equipped with unique bank of large bulk output capacitors that further enhance its transient speed, sonic authority, macro dynamics, and presence. 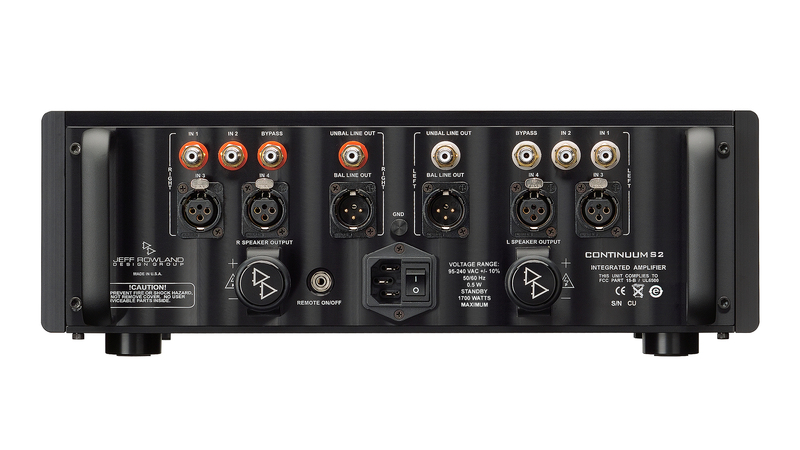 Dual line-level outputs (balanced and unbalanced), balanced and unbalanced inputs, and preamp bypass inputs allow unprecedented compatibility with audio and A/V components, while optional high quality phono cards are available for compatibility with vinyl sources. Balanced input and output topology, including active positive and negative leads on Cardas output terminals for optimum speaker control, yields high common rejection ratio of 85dB over 20 to 20 KHz audio frequency band. Transformer coupled input circuitry provides universal component compatibility and virtually eliminate ground loop noise and RFI/EMI. Transformer coupling ensures identical overall gain with all inputs. Other benefits include ground noise isolation and excellent common mode noise rejection (CMRR) from all sources. Dual rate volume control allows precision level adjustments over nearly a 100 dB range. The volume control incorporates a permanently noiseless optical encoder that always maintain its tactile feel, accuracy, and channel balance at all settings. The volume can be adjusted from 0dB to 99.5dB from the volume knob on the front panel, as well as from the 9 function remote control. Rapid turns of the volume control adjust the volume by 1.5dB increments. Slow turns of the control allow for very fine adjustments by 0.5dB increments. Rocker switch on back panel coupled to timer relay, turns Continuum quietly on to full power after circuit stabilization. Six-function remote control transmitter with individual input select buttons controls volume, input selection, mute, and channel balance. Supports 12V remote ON/OFF remote trigger for power switching via 1/8” jack on rear panel. Grounding post for star-grounding and other advanced configurations is accessible on the rear panel. 15 Amp female IEC AC power connector.